This is the long course that follows the Marshyangdi River, crosses Thorang Pass (highest pass in the country) from the bottom of Manang village. 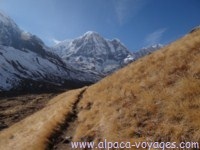 This trek offers the roundabout tour of the Annapurna region, crosses about 30 km around the entire Annapurna massif. It allows us to know the variation of scenery at the limit of Thorung Pass and the remain around the sacred area of Muktinath. The variation in culture to be witnesses from the Tibet-like country on the north to our own native ethnic people like Gurung, Magars resides down the valley. 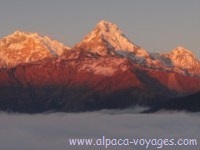 Service includes: airport transfer in a private car, 4 nights in Kathmandu hotel (tourist class) in BB basis, 1 night in Pokhara hotel (tourist class) in BB, 17 days trek in lodge basis, 3 meal & accommodation in the available lodges during the trek, national park fees, Private car Ktm-Besisahar/ flight fare Pokhara-Ktm, one guide, one porter for 2 member, daily wages and meal and accommodation of guide and porter, one porter is allowed to carry maximum of 30 kg of total weight, insurance of guide & porter, full day sightseeing with English speaking guide with all entrance fees, one fare well dinner in Ktm. Service Excludes: domestic airport tax, lunch/dinner at Pokhara and Kathmandu, laundry, telephone calls, emergency evacuation if required, donation, tips and all personal nature expenses. Day 03	After breakfast, ready to start for the bus drive from Kathmandu-BesiSahar. Early start in the morning for Besisahar, this road also leads to Pokhara, about 7 hours h trip. It’s a long way with a quite some part with the rough road, but the rice fields scenery is a wonderful to watch. Over night at the lodge in Besisahar. Day 04	Besi Sahar (820m) - Ngadi (950m).The first day of walk starts across the rice fields with the stunning views of Himal Chuli (about 7200m). We walk along the Marsyangdi river, upsetting of power, crossing the first suspended bridge that we enjoy to swing.. Later on we come to the first remarkable villages (Bulbulhe). Cross the suspension bridge, pass the village, follow the trail through paddy field and we will come to Tarangche, a Tamang village and ahead of this we come to Ngadi Bazar, small hamlet, near the torrent. We stop here for the night in the lodge. 4.30 hrs walk. Day 05	Ngadi-Jagat (1310m). We cross the suspension bridge of Ngadi Khola and climb steep walk up to reach Bahundanda, the Bahun, Tamang & Gurung of cast live in Bahundanda. And then moving through bamboo forest, terraced field, and crossing the suspension bridge we come to the village of Syanje where strong Tibetan influence culture is witnessed. The valley narrows, the river is definitely hemmed in by steep banks and foaming; waterfalls tumble down on both sides, after moving continuously small ascents and descents we come to Jagat, which will be our overnight stay. 5hrs walk. Day 06	Jagat-Dharapani (2000m). The trail move along the river with many ascents & descents, river becomes narrow and the rock faces on the both side becomes steeper. Before long we will reach to village Chamje. The river in front of the village runs very fast and there is steep rock face behind the village. We soon leave the village, cross the suspension bridge, the river becomes pleasant as we walk through the maize fields which have replaced the rice fields before reaching Tal (1700 m), a small village stuck under huge cliffs. The trek has now entered Manang district, the trail crosses the broad , flat village, small stream on a wooden bridge then makes its way to Shirental. Climb past several bhattis to reach Ningala,keep walking on the flank to Khorto. Cross the suspension bridge and we will reach to Karte. From Karte, we walk again the level road on the left bank, cross the suspension bridge, climb up the terrace and enter to Dharapani village (2000 m), villages built with mani walls, slate roofs and wooden balconies. Overnight at Dharapani, 5 hrs walk. Day 07	Dharapani-Chame (2700m) After breakfast we start our walk and in an hour we reach Bagarchap (2164 m) village, built with mani walls and we can even see some of the monasteries around, people are called Bhote Gurung, Tibetan Buddhist. After climbing from Bagarchap we will come to Danque and if you turn around point of view of 8163 m peak of Manaslu comes as a reward. We can also enjoy the hot spring bath in the Latamrang hot spring. 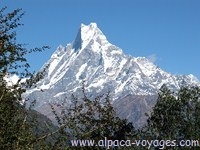 The trek after now goes through forested area, pine trees and you will see Annapurna II (7937 m) and you will approach to Koto. 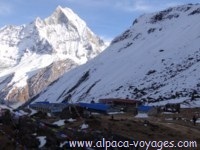 And a little more climbing and you will come to Chame, good place to spend the night. Chame, capital of the Manang district with its numeral shops and its unrestricted outlook over Himal Chuli. 5hrs walk. Day 08	Chame-Pisang (3200m). Today we walk through the pine trees forest and later come to open area of Talekhu. Climb along the river side with several ascents & descents and come to a high huge rcok cliff near about 300 meters tall. Before long you will be in Bhartang village. Again keep on walking through pine trees, cross suspension bridge, climb steep slope and in front of you stands again huge tall and wide rocky cliff about 300 m tall & 600 m wide. We follow the path by descending and later becomes level and you will cross chorten and mendan colored in white and as you keep on walking you will begin to see Pisang Peak (6091 m) through the trees. Before long you will reach Pisang village. You can view of Annapurna II on your left. This is known as Manang area. Today we stay at the lodge at Pisang, a village with Tibetan influence culture. We visit the gompa, Buddhist temple. 4h30 walk. Day 09	Pisang-Manang (3500m). 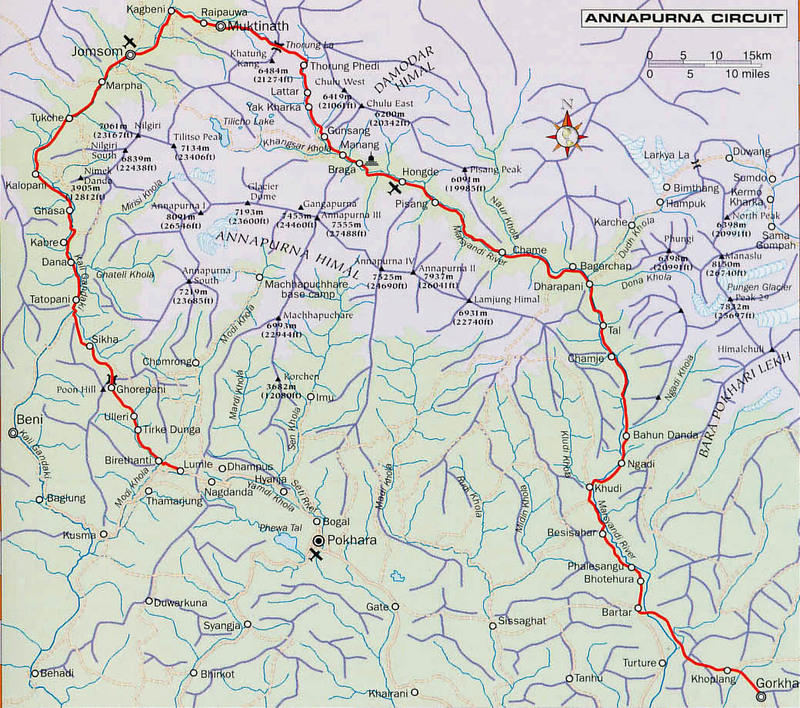 Today’s walk will be all day walking and witnessing with the huge glacial barrier of the Annapurna IV, II, III north faces, one of the most spectacular mountain with beautiful landscape. We also come across the beautiful village of Braga where a temple is built with the marbles only. After Braga our most awaited village called Manang will be there waiting to welcomes all of us with a big smile. Our stop for the overnight will beat Manang. 7hrs walk. Day 10	Explore Manang: Today’s is the day to explore Manang Valley and this will be also good for acclimatization to get prepared to cross the most awaited THORANG PASS. 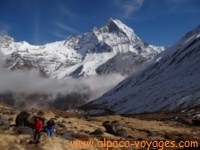 We walk up to Khangsar Village & Khangsar gompa (3920m) today. A 5.30 hours loop circuit with sublime landscapes. Those who are tired may not to go and relax at or around Manang. Day 11	Manang-Leder (4200m) A quite short walk for enjoying that amazing village of Manang. Camp after a 4h30 stage. Day 12	Leder - Thorang Phedi (4500m). Today’s walk will also be short for avoiding altitude sickness. But, the majestic views of high mountains and several enough sceneries are spectacular. Today is night before combat with Thorung crossing. In the afternoon possible acclimatization while going up towards the pass. Overnight at Thorang Phedi. 3hrs walk. Day 13	Thorung Phedi-Thorung La (5417m) Muktinath (3700m). It is good & wise to start very early on this day to avid strong wind at the top of Thorang La. The ascent walk will be long of about 4.30 hours and again down seems like it never ends, but, this is the charm and unforgettable moment one can desire of this trek. After long & exhausting walk of up & down we reach at sacred place of Muktinath, also a pilgrimage spot of all Hindu religion. Muktinath is the doorways of Mustang, the old Lo Kingdom. 8hours walk. Day 14	Explore Muktinath & surroundings: Hike to Museum and nunnery and Tibetan influenced village for the day. Day 15	Muktinath - Marpha. (2700m). A dry landscapes opening on the Tibetan plateau to the north, high mountains covered with snow on the south like Nilgiris Mountain and breath taking views of Dhaulagiri makes the day of any traveler who passes by this spot. On the way down to Jomosom, we cross the old fortresses of Jarkhot and Kagbeni which are worth visiting. In that last place, we meet with Kali Gandaki, the river we will follow during 4 days. The bottom of the valley, wide and rocky, with encountering by the fierce wind we will face. The administrative and trading center of Jomosom is the center of the area. We walk to Marpha and stay for the night there. 7 hours walk. Day 16	Marpha - Kalapani (2500m). 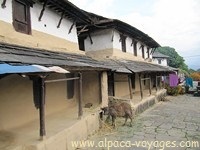 Marpha is a remarkable and interesting village to have a stroll. Marpha has its own factory where it produces its own brandy from the apple andit is quite popular in the locality too. The trail is not easy as the sharp stones at the bottom of the valley and always the strong wind makes the walking little tough, but, this is too a kind of adventure and can be recalled with nice memories when getting back home. The stony & windy trail is compensated by the majestic and impressive peaks and some caravans of mules & donkeys on the way. In the middle of pine trees forests, Kalopani is one of the few places where we can see Annapurna I. We can see also very nice Thakali villages. Our stop will be at Kalapani for the night. 5h30 walk. Day 17	Kalopani - Tatopani (1200m). The long descend walk along the turbulent but wonderful gorges river will make the walk pleasant more than exhausting down walk. Another interesting factor of this trail is we witness variation of landscapes like from alpine zone to sub-tropical zone, dcops and villages as well as their culture keeps on changing during the entire walk. We stay at the lodge at Tatopani, hot spring, today. 7 hours walk. Day 20	Birethanti-Nayapool (1070 m): Hardly 25 minutes walk is up to Nayaand. After having some time there will be a transfer to Pokhara. (820m). Today we shall stay at the hotel booked in advance. Afternoon & evening is free and you can utilize it by witnessing small town of Pokhara. Day 21 Fly Pokhara-Ktm, its about 30 minutes flight. At the airport of Kathmandu you will be picked up and transferred to the hotel. Day 22	Free-time in the morning & afternoon for shopping, in the evening farewell dinner is arranged . Day 23	Airport drop for the final departure.